More than 200,000 people live in rented apartments in unincorporated areas of Los Angeles County. Right now, their landlords can increase rent by however much they want, but that could soon change. On Tuesday, the L.A. County Board of Supervisors passed 4-1 a motion that moves the county towards rent stabilization. If ultimately enacted, the proposed policy would limit annual rent increases to 3 percent each year for residents who live in most of the apartments outside the boundaries of the county's 88 cities. 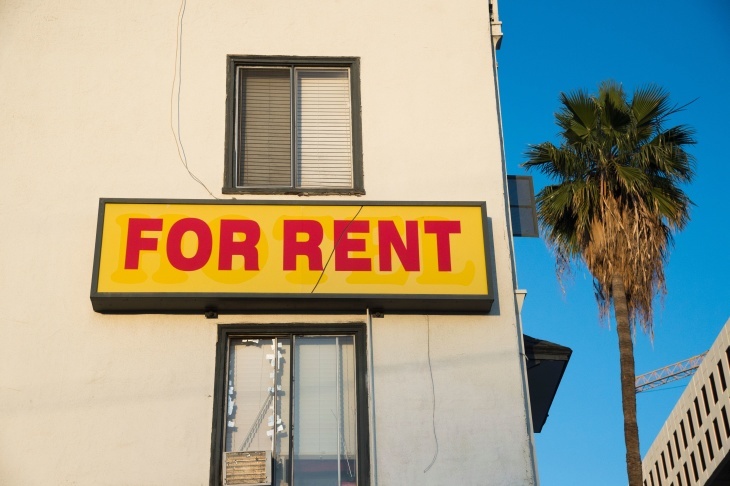 County staff now have two months to draft an ordinance that would stabilize rents for approximately 57,000 rental units, while the supervisors develop a more comprehensive tenant protection policy. Supervisor Sheila Kuehl, who authored the motion the board approved Tuesday, says rent stabilization is a tool county government can use to reduce of people who fall into homelessness. "Many people say, 'oh, it's people with mental health issues.' But you can see in all of the literature that those with mental health issues are about a third of the people who are homeless," said Kuehl to LAist. "The other two thirds are primarily homeless because of economic issues. In Los Angeles County, that has a great deal to do with how the rents have increased and increased and increased." Kuehl pointed to a study released last year by Zillow that found a 5 percent increase in countywide rent correlates to a 3 percent increase in homelessness. Right now, only a few cities in L.A. County — Los Angeles, West Hollywood, Beverly Hills, and Santa Monica, to be exact — have rent stabilization (RSO) or tenant protection ordinances on the books. For example, the city of Los Angeles' ordinance limits rent increases to 3 percent annually, and enshrines "just cause" eviction procedures for tenants living in apartment buildings built before Oct. 1, 1978. Rules governing how much rent can increase, and what buildings are affected, differ slightly in WeHo, Santa Monica, and Beverly Hills. But landlords in the county's remaining 84 cities, as well as its unincorporated parts, are legally allowed to raise a tenant's rent without any limitation at the end of a lease, so long as they provide the tenant with 30 to 60 days' notice, depending on the amount of the rent increase. In a healthy market with lots of new housing construction, persistent rent hikes aren't necessarily an issue. But in Southern California — where the rate of housing construction has been significantly slower than the overall growth of the region's population since the 1980s — there are many more people searching for homes than available housing stock. "If you look at the vacancy rate in Los Angeles County, for example, it's around 3 percent. That's considered very low," said Paul Ong, a research professor at UCLA and the director of the school's Center for Neighborhood Knowledge. "It's a very tight housing market, and in tight housing markets economic power shifts to landlords. That manifests with rent increases that place a huge burden on renters." Ong and his team of researchers have been tracking how the Southern California rental market has changed over the past 30 years. "What we're seeing is rents are increasing faster than inflation, and faster than people's incomes," Ong said. "We have reached a point now where many households are unable to pay their rents, and they're in danger of being displaced. They quite often have to decide between paying the rent and paying for other daily necessities." According to the motion voted on by the supervisors Tuesday, inflation-adjusted median rent in L.A. County grew by nearly 25 percent between 2000 and 2012, but inflation adjusted incomes declined by 9 percent over the same period. Critics of rent stabilization and tenant's rights say those policies lead to fewer new units because it limits the profit margin for land developers. Ong disagrees. "When we looked at the number of new units built in L.A. County, there's only a marginal difference in construction between the jurisdictions with rent control, and those without," he said. "In other words, the critics comment that rent stabilization or rent control is going to dampen supply — historically we haven't seen that." WHY DO I KEEP HEARING ABOUT RENT CONTROL? The overall stress California renters — especially poor ones — are feeling is why rent stabilization and tenant's rights are such hot topics. California voters will head to the polls Nov. 10 to decide on Proposition 10, which would repeal the Costa-Hawkins Rental Housing Act if passed. Costa-Hawkins effectively exempts apartments built after 1995, as well as single family homes, from any sort of rent stabilization rules. For now, the proposed county ordinance would work within the confines of Costa-Hawkins, effectively bringing rent stabilization to all apartment units built in unincorporated L.A. County before 1995. Tuesday's action is a stopgap intended to hold rents roughly where they are right now while the supervisors study a recently released report on tenant protections in the County. Its findings are effectively a blueprint for a more comprehensive county tenant protection and rent control plan, beyond just rent stabilization. That report was produced over several months by a working group comprising representatives from various real estate, developer, and tenant's rights interest groups in the county. It outlines three big areas where the county could pass legislation to minimize the number of renters getting kicked out of their homes because they can't afford the increased rent. The first is to pass a rent-stabilization ordinance that limits how much landlords can raise rent each year, which is effectively what the motion Tuesday aims to do. The report recommends tying that amount to the Consumer Price Index. It also recommends passing rules that allow tenants to petition for a rent decrease if on-site services are reduced, requires all affected units to be registered with the county, and sets up a county-run landlord-tenant mediation process. The second overarching recommendation is to beef up tenant protections against eviction, which would limit the reasons a landlord can terminate a tenancy. Establishing "just cause for eviction" protections would do this, by defining specific reasons (or, causes) a landlord can terminate a tenancy. As of September 2018, it is legal for a landlord in unincorporated L.A. County to serve their tenants with a 60 day notice to vacate. Besides limiting rent hikes and eviction, the report also recommends formalizing procedures for renters to complain about poor conditions, as well as rules against landlord harassment and discrimination. 4:45 p.m.: This article was updated with the supervisors vote. This story originally published at 6 a.m.